Today we are with Miya from Jellyfishjelly! Hello readers and greetings from Australia! It is a huge honor to be asked to present my first ever guest post. Thank you F&J! My name is Miya and I am the demented craft tragic behind “Jellyfishjelly; Crafty Ideas for Uncrafty Parents” I have an academic and employment background in arts and art supplies. But the real catalyst for creating my blog was the birth of my 2 children. My children are 6 and 4. I currently spend my days looking after my family and writing my blog – often concurrently. As I write this my daughter is plonked next to me painting some foam bugs with nail polish. Today I am presenting my ‘Christmas Photo Lanterns’. I spend hours photographing and cataloguing my work, so it is a little ironic that I should pick the one project I found seriously difficult to photograph. Trying to capture shiny, transparent surfaces is no mean feat. This is the best I could do, I hope you can follow the images OK. Here's an alternative to sending out Christmas cards with photos of reluctant children/pets in reindeer horns. This year why not send a personalized tree ornament using family photos? Acetate is a thin, clear plastic sheet, originally used for overhead projectors. It is sometimes called OHP Film or transparencies. Find it at stationery, arts and crafts or card making suppliers. You will also need: double sided tape, curling ribbon, Christmas ribbon/tassels etc, scissors and photos. Cut the acetate into quarters. If your photos are larger than standard, cut the sheet to fit the photo. Quarter size pieces are economical as there is no waste. Stick the double sided tape down the 2 long edges and on one short edge. Make sure the tape does not overlap. Peel off the backing tape. Roll the sheet, sticking the short sides together. Make sure the tape is on the outside of the lantern. Stick a piece of curling ribbon to either side of the top of the edge. This will make a loop to hang on the tree. Attach strips of more curling ribbon, Christmas ribbon or tassels to the top and bottom strips of tape. Choose a photo with images that will suit the shape of the lantern. The faces need to be reasonably small to be seen. Gently roll the photo and slide it into the cylinder. It should stay if you haven’t rolled it too tightly. If it falls out, fix with a small piece of tape or glue – behind the ribbon. That's it! Pictured below are links to more of my Christmas projects. Click the image to go to the post. I do hope you will stop by. 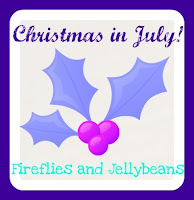 Sincere thanks, again, to Fireflies & Jellybeans.